Jonathan Davis compliments VIAVI’s Observer Apex as presented at Tech Field Day Extra at Cisco Live. He sees it as a monitoring tool that is simple and intuitive, while still providing valuable information about your environment. Jonathan looks forward to learning more about VIAVI in the future. In this piece, Tom Hollingsworth looks at the announcements from Cisco Live US 2018. What stood out to him was the prominence of a non-networking specific topic, the cloud. He specifically examines how Cisco took pains to show how they are aligned with Google’s vision of the cloud, and integrate that across their product lines. 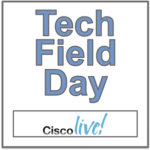 Tech Field Day Extra at Cisco Live US 2018 will have a number of presentations next week, including four by Cisco. In this post, Breana Jordan previews the sessions, which will look at Cisco solutions for hybrid cloud, multicloud, and containers.